BULLETIN: A trader and TV analyst declared a “fugitive” in February by Manhattan District Attorney Cyrus R. Vance Jr. now faces a restitution order and penalties totaling more than $12.5 million in a lawsuit filed by the CFTC. 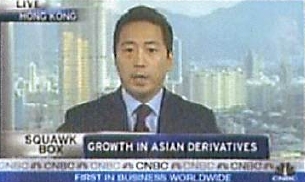 Brian Kim, 35, the operator of a hedge fund known as Liquid Capital Management LLC, appeared on CNBC at least three times in 2009. While reporters were asking Kim to analyze marketplace developments and share his thoughts with the TV audience, he was at the helm of a complex, ongoing Ponzi and fraud scheme and presiding over a cover-up, according to court filings. U.S. District Judge Denise L. Cote entered an order against Kim April 15 that requires him to pay more than $3.1 million to customers he defrauded and a trebled financial penalty of nearly $9.4 million. “The order finds Kim and LCM liable as to all violations alleged in the CFTC’s complaint,” the agency said. Kim’s whereabouts was not immediately clear. In February, investigators said Kim’s fraud was occurring even as he was holding forth on TV on issues such as the Dubai debt crisis, derivatives trading in Asia and so-called “dark pools” that provide institutional investors outlets to trade anonymously in murky conditions. “The defendant induced his clients to make risky and speculative investments by portraying himself as an accomplished trader and money manager,” Vance said in February. He added that a bench warrant had been issued for Kim’s arrest.